You don’t have to dig very far to come up with a tunnel in Pittsburgh. No one knows for sure how many tunnels there are in the area, but we’ve got short pedestrian tunnels, railroad tunnels, major traffic tunnels, and everything in between. Our bridges get a lot of attention, but our tunnels are just as important for getting around, as any tunnel shutdown and the ensuing traffic nightmares illustrate. The Liberty Tunnels, also known as the Liberty Tubes, are the oldest tunnels in Pittsburgh. At one time, they were the longest automobile tunnels in the world. They opened on March 23, 1924, and provided cars as well as horse-drawn wagons with a direct link from Downtown Pittsburgh to the South Hills instead of having to travel around Mt. Washington via the West End. They were named “Liberty” with a hope for lasting peace after the Allied victory in World War I. Ground was broken on the tunnels in December of 1919, and it would take excavation crews nearly four years to blast away more than 400,000 tons of rock and dirt to build the 5, 889 ft. tunnel. The tunnel’s opening spurred an economic expansion in the South Hill, where real estate prices soon soared, and housing developments proliferated. Unfortunately, five months after the tunnels opened, traffic congestion inside it caused a buildup of carbon monoxide. Twelve commuters were overcome with the gas, necessitating the quick installation of a ventilation system that continuously pumped fresh air into the tunnels. 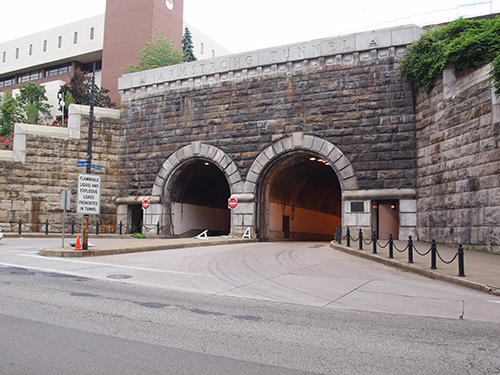 Named for Joseph G. Armstrong, who was Allegheny County Commissioner at the time of their construction, the Armstrong Tunnels opened in 1927 and connected Second Avenue to Forbes Avenue, travelling under the Bluff where Duquesne University is situated. After Pittsburgh annexed the town of Birmingham in 1872, which is now more commonly known as the South Side, a direct passage under the Bluff to the South Side was proposed and construction began on the tunnels in 1926. The tunnels are unusual in that they have a 45-degree bend in them. Legend has it that the bend was a mistake by engineer Vernon Covell and that he committed suicide because he was so embarrassed by his error. That tale is false; Covell lived and went on to design other projects. Most believe the tunnel was designed with a curve so as not to disturb some of the university buildings above it. It also has a pedestrian walkway. If Pittsburgh is the “Gateway to the West,” then the Squirrel Hill Tunnels are the gateway to the east out of Pittsburgh. Construction began on the tunnels in 1946, and they opened for traffic on June 5, 1953, as a vital part of the Parkway East. The Squirrel Hill Tunnels are the second largest in Allegheny County at 4,225 feet and pass under the Squirrel Hill neighborhood of the city. The tunnels were built to accommodate traffic to and from the city to the expanding suburbs after World War II and are heavily traveled, as the rush hour traffic jams attest. Observant drivers will notice that there is an office space above the tunnels. When the tunnels were built back in the 1950s, there wasn’t the technology that we have today, and the workers controlled the tunnel from there. Today, the space is used primarily for storage as most of the tunnel monitoring is done remotely. The Fort Pitt Tunnels carry traffic on I-376, or the Parkway West, from the West End to Downtown Pittsburgh underneath Mt. Washington. 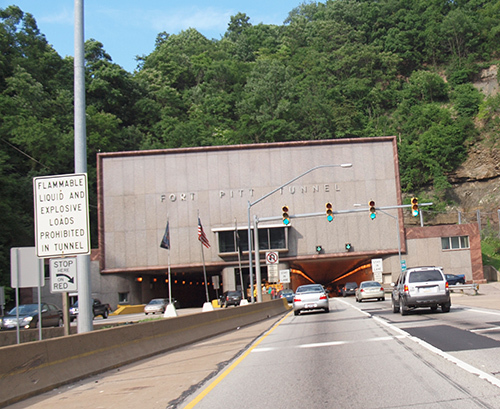 Like the Squirrel Hill Tunnels, the Fort Pitt Tunnels were constructed to accommodate the traffic coming to and from the city from the expanding population in the suburbs after World War II. Groundbreaking was on April 17, 1957, and they opened on September 1, 1960. It accompanied the completion of the Fort Pitt Bridge. Tunnels are dark and confining, and don’t provide the views that bridges do, but nevertheless, they are an integral part of our traffic system and are an essential element of what makes Pittsburgh so special. The post Digging Pittsburgh’s Tunnels appeared first on Popular Pittsburgh.